In 2018, the world economic situation continues undergoing profound changes and the need for countries to improve global economic governance is even more urgent; international energy supply structure continues to change and trade frictions continue to intensify. With the gradual deepening of the global green chemical development concept, safety and environmental protection are more valued, production processes are constantly upgrading, and the global chlor-alkali industry faces many opportunities and challenges. 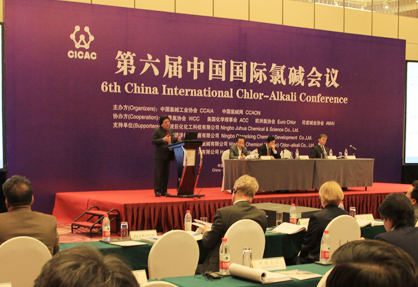 CCAIA and CCAON will hold the 7th China International Chlor-Alkali Conference on October 17-19, 2018, in Kunming, Yunnan Province.China International Chlor-Alkali Conference has become a high-end conference brand in the world chlor-alkali industry, with a number of more than 300 people from no less than 20 countries to gather together to discuss and explore global industrial hotspots , technological innovation and market trends. The conference will track the global hot topics and market trends as in the past conferences, meanwhile, the conference will create a platform for both domestic and foreign industrial insiders to exchange market information. 14. How to effectively link the development of resin and downstream applications? 1. The meeting registration fee is USD1200/person. 2. Preferential registration fee can be obtained, if payment can be made before August 15th. In that case, registration fee is charged at USD1100/person. Copyright©2007-2014 CCAON. All Rights Reserved.